Super Eagles beat Libya 4 0 in Uyo on Saturday. South Africa achieved their biggest victory when they hammered the Seychelles 6-0 Saturday in an Africa Cup of Nations qualifier before a tiny rain-soaked crowd in Johannesburg. Three minutes of stoppage time given in Uyo. This has been a routine win for Nigeria but it is certainly a game to forget for the neutrals and Libyan fans. 88′ Nigeria continue to ease their way to victory with Samuel Kalu finding the back of the net. He gets the ball outside the Libyans’ 18-yard box from Henry Onyekuru before curling a ferocious shot past Mohamed Abdaula. What a match! 76′ Ighalo has got a splendid evening and Isaac Success will now be given the task of leading the line. 50′ Quite simply Libya need to do more in the second half after a lackluster display in the first 45 minutes. Sadly enough, they have no fans to back them in the stands but they need something to smile about! 46′ We are back underway for the second half as Nigeria try to build on their slender lead. Gernot Rohr’s men will be looking for a second and they could well find it unless Libya raise their game. The Mediterranean Knights have just gone through the motions so far and they need to give Bader Hassan Ahmed some support before they lose this evening. Odion Ighalo’s penalty is the difference at the interval and Nigeria definitely deserved to be in front. Etebo has been superb so far as he pulls the strings, while Jamiu Collins and Francis Uzoho have also looked sharp. 42′ Whistling can be heard around the Godswill Akpabio Stadium and it appears that some of the home fans have lost their patience with the Super Eagles’ missed chances. 27′ The tempo of the game has dropped significantly after 28 minutes. Nigeria cannot afford to put their legs off the pedal after their dominance in the opening minutes. 15′ Libya build possession from the back around the Nigeria half, but are stopped from moving further forward by a press from the Green shirts. 6′ Libya have now started to get back into the game and Sand Masaud and Ali Mohamed are the brains behind their moves. The two teams are now in the tunnel and we are just minutes away from kick off. The national anthems await! 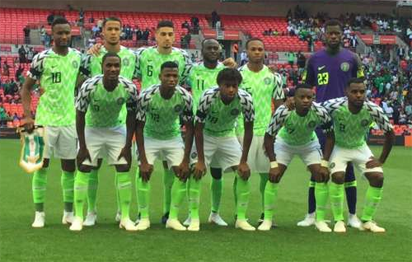 Victory for Nigeria will set them up nicely into the crunch game against the Mediterranean Knights in Sfax and that would pile the pressure on Libya. They look unsettled following the unexpected resignation of Adel Amrouche. Omar Al-Marime will be hoping to grind out a positive result in Nigeria as victory will put them in the front race for a place in Cameroon 2019. Libya were considered dark horses by some when the draw was made but the north Africans have surprised many, and the process have remained unbeaten after two games. They spanked Seychelles 5-1 before holding South Africa to a 0-0 draw in Durban. I am your host Shina Oludare and feel free to follow me on Twitter @sportingshina. Hello and welcome to our live text commentary of the 2019 Africa Cup of Nations qualification Group E match between Nigeria and Libya in Uyo. This is the first ever meeting between the two sides in any qualifying series and they head into the game knowing that Seychelles were decimated by South Africa earlier this afternoon.